The king was only nineteen when he died, perhaps murdered by his enemies. His tomb, in comparison with his contemporaries, was modest. After his death, his successors made an attempt to expunge his memory by removing his name from all the official records. Even those carved in stone. As it turns out his enemie's efforts only ensured his eventual fame. His name was Tutankhamen: King Tut. 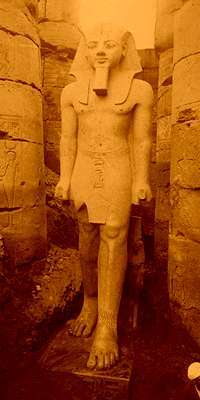 The ancient Egyptians revered their Pharaohs as Gods. Upon their deaths the King's bodies were carefully preserved by embalming. The mummified corpses were interned in elaborate tombs (like the Great Pyramid) and surrounded with all the riches the royals would need in the next life. The tombs were then carefully sealed. Egypt's best architects designed the structures to resist thieves. In some cases heavy, hard-granite plugs were used to block passageways. In others, false doorways and hidden rooms were designed to fool intruders. Finally, in a few cases, a curse was placed on the entrance. Carnarvon summonded Carter to England in1922 to tell him he was was calling off the search. Carter managed to talk the lord into supporting him for one more season of digging. Returning to Egypt the archaeologist brought with him a yellow canary. Perhaps it did. On November 4th, 1922 Carter's workmen discovered a step cut into the rock. Then they found fifteen more leading to an ancient doorway that appeared to be still sealed. On the doorway was the name Tutankhamen. When Carter arrived home that night his servant met him at the door. In his hand he clutched a few yellow feathers. His eyes large with fear, he reported that the canary had been killed by a cobra. Carter, a practical man, told the servant to make sure the snake was out of the house. The man grabbed Carter by the sleeve. Carter immediately sent a telegram to Carnarvon and waited anxiously for his arrival. 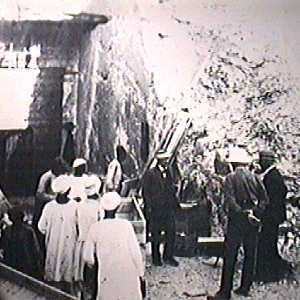 Carnarvon made it to Egypt by November 26th and watched as Carter made a hole in the door. Carter leaned in, holding a candle, to take a look. Behind him Lord Carnarvon asked, "Can you see anything?" The tomb was intact and contained an amazing collection of treasures including a stone sarcophagus. The sarcophagus contained three gold coffins nested within each other (left). Inside the final one was the mummy of the boy-king, Pharaoh Tutankhamen. The day the tomb was opened was one of joy and celebration for all those involved. Nobody seemed to be concerned about any curse. A few months later tragedy struck. Lord Carnarvon, 57, was taken ill and rushed to Cairo. He died a few days later. The exact cause of death was not known, but it seemed to be from an infection started by an insect bite. Legend has it that when he died there was a short power failure and all the lights throughout Cairo went out. On his estate back in England his favorite dog howled and dropped dead. The press followed the deaths carefully attributing each new one to the "Mummy's Curse." By 1935 they had credited 21 victims to King Tut. Was there really a curse? Or was it all just the ravings of a sensational press? Perhaps, the power of a curse is in the mind of the person who believes in it. Howard Carter, the man who actually opened the tomb, never believed in the curse and lived to a reasonably old age of 66 before dying of entirely natural causes.